Ever get to a new exciting city but you just don’t have the time to see everything you want? Tourist buses or sprinting through the subways to see enough in time doesn’t sound like fun to you? We have a solution for you that will have your hair blowing in the wind, check out a city for the first time on an electric skateboard! Plenty of cities are great to see on an e-skate, but Paris is perfect since more and more areas are banned to car traffic. If you are only in the city for 2 days, see it from the outside. Wander around, get lost and that next time you can wait in line for Picasso and Van Gogh or go inside a monument like the Eiffel Tower. Instead of waiting in lines, this time you will zip from one site to the next. See the real people, smell the neighborhoods and dodge the pigeons! So this sounds great but you don’t have your e-skate with you or don’t own one yet? In Paris one of our first Mellow owners, Renaud, can help you. 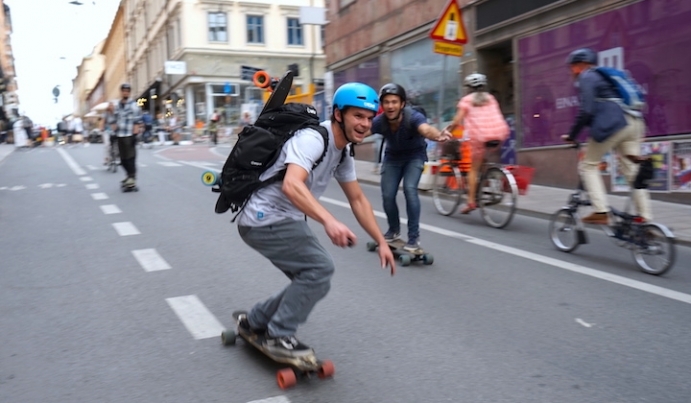 On AirBnB he’s offering sightseeing tours on an electric skateboard. He has a few e-skates including a couple Mellows and some Boosted Boards. He wants to let you see Paris the way the locals do and let you ride along the river Seine on roads that are car-free. You can see some of the great sites that Paris has to offer including the Place de la Concorde, Eiffel Tower, Tuileries Garden, Les Invalides, The Louvre, The Grand Palais, Île Saint-Louis, Notre Dame, D’Orsay Museum, many infamous bridges, and much more. Take a break on a peaceful spot only a local would know and get to know the tales of the past while sipping hot tea, because Renaud is also a tea expert! Whether you want to try out a Mellow before you get one for yourself or just want to go on a romantic ride through Paris and not waste your time with messing up subway trains or getting stuck in taxis, then book Renaud on AirBnB next time in Paris for some real fun! You are looking for test ride opportunities in other cities? Check our shop finder or subscribe to our Mellow News to stay tuned!